Alan Davie is an exceptional artist. For over fifty years, he has built a body of work of inspiring import, oblivious to the shifting trends of artistic fashion and critical dicta. In its many different stages, Davie´s bold, risk-taking painting has always been soaked in the worlds of dream and dance, music and mysticism. Such worlds offer a much-needed antidote to the sterile rationalism of much of our culture - as does the aesthetic and spiritual power of Davie´s work, flowing as it does from both the unpredictable depths of unconscious improvisation and a distinctive command of the nuances of colour and line. Alan Davie is the great painter of jazz this century. ALAN DAVIE, born September 28, 1920 at Grangemouth, Scotland, the son of a painter and etcher. 1938 beginning of interest in jazz. 1940 awarded diploma, Edinburgh College of Art. 1941 awarded travelling scholarship; served in the Royal Artillery. 1943 began to write poetry and played altosax in various groupings. 1946 demobilized; first one-man exhibition in Edinburgh; member of the Tommy Sampson Orchestra as tenorist.1948 travels through Europe. 1949 residency in London. Made a living by making jewellery (f.e. for actress Vivian Leigh in ´Antonius and Cleopatra´) and playing jazz (alto-, tenorsax, piano). 1950 first one-man-exhibition at Gimpel Fils. 1956 first one-man-exhibition in New York. Met Pollock, Kline, De Kooning, Motherwell and Rothko. 1959 participant of Documenta II; 1964 Documenta III. 1971 first public recital of music, Gimpel Fils Gallery, London. Alan Davie Music Workshop, first record published; three more records followed in 1972. Awarded CBE. Murals for school in Berlin, commissioned by architect Peter Haupt; design of a poster for the Olympic Games in Munich. 1973 first encounter with Tony Oxley, the European pioneer of electrified drums. 1975 music concert in Musée d´Art Moderne, Paris. Since the mid-fifties hundreds of one-man shows in leading galleries and museums worldwide. Numerous awards, prices and retrospectives since 1958 (Whitechapel Art Gallery, Walker Art Gallery; Stedelijk Museum 1962; Kunsthalle Baden-Baden, Kunsthalle Bern, Kunstgewerbeverein Pforzheim 1963; Talbot Rice Gallery 2000; Cobra Museum 2001). In 2003 various one-man-exhibitions in London and St. Ives (Tate Gallery). This is the first show of his paintings in Berlin. The Alan Davie/Tony Oxley duo sessions of 1974/1975, recorded in Zurich and Cornwall, had been re-released in February 2003 on a/l/l, a division of FMP FREE MUSIC PRODUCTION Distribution & Communication. Davie has been working also with Barry Guy, Evan Parker, Daniel Humair and many others. Alan Davie has released five albums of improvised music which he recorded at a variety of locations from 1970 to 1975 (The Alan Davie Workshop 001 - 005). We greatly acknowledge the active collaboration of Alan Davie, Tony Oxley, René Gimpel, Georg Nothelfer and Michael Tucker in the preparation of this exhibition and festival. "Jede klangliche Nuance wird mit einer Ernsthaftigkeit, einem Maß an geistiger Versenkung, an kontemplativer Konzentration zelebriert, wie es im heutigen Musikleben einzigartig ist. Besonders eindrucksvoll ist dies, wenn Grillo eigene Kompositionen vorträgt: die meditative Qualität des Spiels verbindet sich dann mit einer ganz darauf abgestimmten Ästhetik - Interpret und Komponist auf der Suche nach der materia prima des Klangs" (Peter Niklas Wilson). Fernando Grillo, contrabass-soloist and internationally renowned composer of contemporary music. Has received numerous awards. Harrison Birthwistle, Earle Brown, Aldo Clementi, Iancu Dumitrescu, Morton Feldman, Klaus Huber, Joachim Krebs, Luca Lombardi, Giacomo Manzoni, Luigi Nono, Francesco Pennini, Henri Pousseur, Karlheinz Stockhausen, Horatio Radulescu, Giacinto Scelsi, Witold Szalonek, Christian Wolff and Iannis Xenakis have written compositions for this ´buddha of contrabass´ (Karlheinz Stockhausen) which he performs worldwide. As soloist he has played with most of the leading European ensembles and Orchestras conducted by Ernest Bour, Elgar Howart, Bernhard Kontarsky, Jerzy Maksymiuk, Andrzrey Markowski, Hans Zender, and others. Numerous recordings with leading radio and television stations in Europe. Performed, together with Marcel Marceau, in `Elogio della Pazzia´ by film director Roberto Aguerre (Biennale, Venice). Professor at the Music Conservatory `S. Cecilia´, Rome; master-classes in Europe, Latin-America, and Asia. In 1987 he founded the Arc-en-ciel Orchestra. Artist-in-residence (DAAD) in 1996. First collaboration in duo with Wolfgang Fuchs (Galerie Ermer); performed in 1998 with Fuchs´ King Übü Örchestrü at the Total Music Meeting. Wir trauern um Peter Niklas Wilson, der am 26. 10. in Hamburg im Alter von 46 Jahren verstarb und widmen ihm posthum das diesjährige Total Music Meeting. Wir laden Sie ein zu einer Gedenkveranstaltung am 6. November, 17 Uhr, in den Clubraum des Podewil, anlässlich der seine Lebensgefährtin, die Kontrabassistin und Musikologin Nina Pollaschegg, den von ihm für das TMM konzipierten Vortrag `Die weiße Leinwand. Zum Verhältnis von Bildender Kunst und Improvisierter Musik´ halten wird - auf eigenen Wunsch, und weil sich Peter so auf Berlin und die Musik/er gefreut hat. Seinem hohem musikalischen und menschlichen Anspruch wissen wir uns verpflichtet. Im Namen aller beteiligten Musikerinnen und Musiker und des gesamten Teams. "Wo beim Musikmachen so viel ausgetragen wird, was Möglichkeiten und Bedingungen von Kommunikation, von Gemeinsamkeit betrifft, sind moralische Fragen tangiert, ob man will oder nicht. Kein Zufall, dass der (vom Komponisten zum Improvisator) konvertierte Cornelius Cardew seine Gedanken über Improvisation ´Towards an Ethic of Improvisation´ überschrieb und sieben ´Tugenden, die ein Musiker entwickeln kann´ herausdestillierte: Einfachheit. Integrität. Selbstlosigkeit. Toleranz. Bereit-Sein (Preparedness). Identifikation mit der Natur. Akzeptieren des Todes." Er hat Maßstäbe gesetzt - als Mensch, Musiker und Musikpublizist. um 12.00 Uhr in der Christianskirche in Hamburg-Ottensens, Klopstockplatz. On the Relationship of Fine Arts and Improvised Music. Why could Jackson Pollock be named one of the founding fathers of British improvised music? Why are so many practicioneers of improvised music also at home with the fine arts? Why did Kandinsky call some of his paintings ´improvisations´? What kind of productive dialectical relationsship exists between design and sound? What are the structural parallels between painting and free music? Peter Niklas Wilson geht einigen der vielen Verbindungslinien zwischen der Bildenden Kunst des 20. Jahrhunderts und der im Jetzt erfundenen Musik nach 1960 nach. Peter Niklas Wilson, Musikpublizist und Kontrabassist. Als Musiker Zusammenarbeit u.a. mit Derek Bailey, Anthony Braxton, Ensemble MusikFabrik, Malcolm Goldstein, Rajesh Mehta, Daniel Ott, John Tchicai. Monographien über Albert Ayler, Anthony Braxton, Ornette Coleman, Miles Davis, Sonny Rollins und zur improvisierten Musik der Gegenwart (´Hear and Now - Gedanken zur improvisierten Musik´, Hofheim 1999). Neueste Buchpublikation: ´Reduktion - zur Aktualität einer musikalischen Strategie´ (Mainz 2003). Lebt in Hamburg. "For Davie, who is able to move with conviction from brush to saxophone and piano, and from playing freely improvised jazz to interpreting Bach suites for solo cello, painting is music, and music perhaps painting." Michael Tucker is Professor of Poetics in the School of Historical and Critical Studies in the Faculty of Arts and Architecture at the University of Brighton. He has curated many exhibitions of contemporary art and written widely in the fields of 20th century art, music and poetry. His publications include 'Dreaming with Open Eyes: The Shamanic Spirit in Twentieth Century Art and Culture' and 'Jan Garbarek: Deep Song'. In 1998 Michael was awarded the degree of Doctor of Letters by the University of Sussex, for 'distinguished contributions to the advancement of learning'. Michael has curated three major exhibitions by Alan Davie: The Quest for the Miraculous (paintings, gouaches and drawings 1959-1993); Alan Davie: Drawings (curated in association with the Scottish National Gallery of Modern Art, Edinburgh) and Alan Davie: Small Paintings. Each of these exhibitions, curated on behalf of the University of Brighton, toured extensively in Britain and each was accompanied by a fully illustrated publication. Michael has been a reviewer for Jazz Journal International for almost 20 years and in 1999 organised the month-long festival ECM: Selected Signs, a celebration of the 30th anniversary of ECM records. Lecture with video samples and slides. The opening concert of this year's Total Music Meeting is a world premiere and a rare opportunity to experience these master musicians from the US performing in trio. Richard Teitelbaum, pianist, composer and performer, professor of Music at Bard College, NY, is known principally for live electronic and interactive computer music composition. Performed his compositions in the US, Europe and Japan. A founder, with Frederic Rzewski and Alvin Curran, of 'Musica Elettronica Viva' in Rome (1966). Has composed works in a variety of genres, including compositions for the Japanese shakuhachi master Katsuya Yokoyama, pianists Aki Takahashi and Ursula Oppens, a choral piece for 20 Japanese Buddhist monks, and multimedia works with Nam June Paik, Joan Jonas, and others. Taught at Vassar College, CalArts, Antioch College, and York University, Toronto. Artist-in-residence of the DAAD, Berlin, in 1985/86. Numerous writings, books, and articles, radio and TV-broadcasts; comprehensive discography. Anne LeBaron, harpist, composer, is widely recognized for her work in instrumental, electronic, and performance realms. As a Fulbright Scholar to Germany in 1980-81, LeBaron studied with György Ligeti, later completing her doctorate in composition at Columbia University. Also an accomplished harpist, LeBaron is renowned for her pioneering methods of developing extended techniques and electronic enhancements for the harp. Leading innovators of jazz and improvised music (M. R. Abrams, A. Braxton D. Bailey) have engaged her in performance and recording collaborations. Her works have been written for virtually every contemporary genre and performed and broad-cast in the US, Europe, Asia and Australia. Has received several awards and prices and published articles and essays in several books and journals. She currently teaches composition at the California Institute of the Arts. Bei den seltenen, wenn auch - über die letzten zehn Jahre - kontinuierlich stattfindenden gemeinsamen Auftritten der beiden Musiker, verläuft der musikalische Austausch gleichwohl wie selbstverständlich. Das vokal gefärbte, oft atem-modulierende Posaunenspiel Christmanns und die offene Lautlichkeit seines Cellospiels vom Wohlklang bis zur Geräuschattacke auf das Instrument treffen auf die offene Skala vorsprachlicher Äußerung bei Minton. Dessen betroffen machender Grenzgang zwischen sanften melischen Floskeln, Rufen und exzessiv ausgetragenen Urlauten der menschlichen Kehle erfährt dabei häufig eine Art subtiler rhetorischer Lenkung über den dramaturgisch bindenden Spielgestus von Christmann. Die Kommunikation der beiden entgeht so der Gefahr, in der einverständigen Koinzidenz eines gemeinsamen rauhen Materials hängen zu bleiben und wird zum musikalischen Gespräch (Elke Schipper). Phil Minton's work is ultimately about spirituality, explored within pure musical terms, the elements of timbre, dynamics, and rhythm approached without reference to time, beat, tune or tonality. You could fairly call it abstract expressionist singing, or even action singing. It was, after all, just such an integration of body, mind, and spirit that defined action painting, as realized by Jackson Pollock whose art Minton discovered in 1957, deciding "that's what music should sound like". Though Minton works with sound, not paint, he can rightly be included in that company (Paul Dutton). Günter Christmann hat gezeigt, dass einem 'akustischen' Instrument Klänge zu entlocken sind, die 'aufregender' klingen als mancher weniger ambitionierte Umgang mit elektronischen Apparaturen. Sowohl in der Kommunikation mit anderen als auch bei der Auswahl des musikalischen Materials geht es Christmann um die Übereinstimmung von persönlicher Haltung, persönlichem Empfinden und Spielprozess (Bert Noglik). Georg Graewe, Pianist und Komponist, gründete 1974 seine erste eigene Formation und leitete in der Folge eine Reihe von Ensembles - vom Trio bis zum Kammerorchester - mit führenden Interpreten und Improvisatoren der Gegenwart. Seine Kompositionen, die sowohl der europäischen Moderne als auch den Entwicklungen der Jazzavantgarde verpflichtet sind, wurden weltweit aufgeführt und sind vielfältig dokumentiert. Graewes erste Oper 'Kopenhagen', eine Auftragsarbeit für die Oper Köln, wurde im April 2003 uraufgeführt. Seit 2002 u.a. Lehrtätigkeit an der Hanns Eisler Hochschule in Berlin. Frank Gratkowski, 1985-90 Studium an der Musikhochschule Köln; Solist in verschiedenen internationalen Formationen (Klaus Koenig Orchester, Tony Oxley Celebration Orchestra, WDR Big Band, Mitglied in Graewes GrubenKlangOrchester). Seit 1990 Solo-Konzerte in Europa, Kanada, USA. Gründete 1995 das Frank Gratkowski Trio mit Dieter Manderscheid und Gerry Hemingway, seit 2000 als Quartett mit Wolter Wierbos. Zusammenarbeit mit Georg Graewe im Duo seit 1992. Uli Gumpert, Pianist und Komponist, gründete 1969 sein erstes eigenes Quartett; formierte und leitete ab 1972 die legendären Ulrich Gumpert Workshop-Bands, in denen fast alle bedeutenden Jazzmusiker der DDR mitwirkten. Seit den 80er Jahren vielfach auch als Solist tätig; einerseits mit eigenen Kompositionen und Improvisationen, andererseits als Interpret der Frühwerke Eric Saties. Schrieb u.a. die Jazz-Suite 'Aus teutschen Landen', in der er Volksmusik verarbeitete. Trio-Arbeit u.a. mit Radu Malfatti und Tony Oxley; Mitglied in Tony Oxleys Celebration Orchestra. Komponierte zahlreiche Theater-, Film- und Hörspielmusiken. Umfangreiche Diskographie. Dietmar Diesner zählt zu den Musikern, die sich Anfang der 80er Jahre vehement als neue Generation im Jazz der DDR zu Wort meldeten (M. Kunzler). Seit 1982 gibt Dietmar Diesner auch Solo-Konzerte und genre-übergreifende Performances mit Schriftstellern und bildenden Künstlern (Hans Scheuerecker, Helge Leiberg, Claus Weidensdorfer, Jürgen Haufe, Matthias Bolz u.a.). Zusammenarbeit mit Tänzerinnen und Tänzern wie Fine Kwiatkowski, Sasha Waltz, Takako Suzuki u.a. Komponierte Bühnen- und Filmmusiken; zusammen mit Günter Baby Sommer Protagonist und 'Saxofon-Actor' in Jürgen Böttchers Film 'Konzert im Freien' (2001). Hörfunk-, TV, und CD-Produktionen, Festivals und Konzerte in Ensembles u.a. mit Tony Oxley, Radu Malfatti, Phil Minton, Georg Graewe, Peter Kowald, Hanno Rempel, Klaus Koch, Joe Sachse sowie Uli Gumpert. Vinko Globokar, Komponist, Posaunist, Musikpublizist. Kompositions- und Dirigierstudium bei Leibowitz und Berio (1964-65 in Berlin). Von 1968-76 Professor für Posaune an der Musikhochschule Köln. Gründete 1968 das Maßstäbe setzende freie Improvisationsensemble 'New Phonic Art'. Von 1976-1979 Leiter der Abteilung vokale/instrumentale Forschung am IRCAM (Paris). Seit 1980 Arbeit mit verschiedenen Gruppen an seinen Kompositionsmodellen und Mitglied mehrerer Ensembles für Neue Musik. Lehrte Komposition an europäischen und amerikanischen Universitäten. Zahlreiche Instrumental- und Vokalwerke sowie musiktheatralische Arbeiten. "Die Originalität von Globokars Schaffen liegt in seiner Doppelrolle als Komponist und Interpret. In den Mittelpunkt seiner kompositorischen Intentionen stellt er ein sozialkritisches 'l'art pour l'homme', das seinen Ausdruck in der Umsetzung sozialer, psychologischer oder humanistischer Probleme in musikalische Werke fand" (Heister/Sparrer). Jean-Pierre Drouet, percussionist and composer. Studied composition with Leibowitz, Barraqué and Hodeir. Has collaborated frequently with Berio and Cathy Berberian, Stockhausen and Xenakis, Boulez and Cage; studied extra-European music (zarb, tablas) with Djamschid Chemirami, Chatur Lal and Dasmal Arora, worked as improviser with 'New Phonic Art', formed in 1968 with Portal, Globokar and Roqué-Alsina. Improvising since then either as soloist or with friends (Frith, Sclavis, Humair, Roach, Kubler, Globokar). Compositions for theatre (J.M. Serreau, J.L. Barrault, C. Régy), dance (Théâtre du Silence, V. Farber, J.-C.Galotta, S. Aubin), concert (ATEM, Musica, Accroche-note, Percussions de Strasbourg, Orchestre de Paris, Ensemble Aleph), opera (Opéra de Bordeaux, Ars Nova). Has collaborated frequently with Kagel and Aperghis (trio Le cercle) and worked with Claudine Brahem, Théâtre équestre Zingaro, choreographer François Verret, and film maker Jacques Rivette. Bertram Turetzky, contrabassist, composer and professor of Music at the University of California, San Diego, acclaimed scholar/researcher in the fields of Jazz history, 18th Century Chamber Music and author of many reviews, articles and the now classic book 'The Contemporary Contrabass' (1974). He has been a key figure in the renaissance of the contrabass and since 1955 more than 300 compositions have been written for, performed by, and recorded by Turetzky, making him one of the few performers, in all music history, to have created a large and impressive repertoire of music for his instrument. Turetzky has been a featured contrabass soloist in the music centers of the United States, Europe, Latin America and Australia.The response to his many concerts, recordings, lectures, writings and his unique sonic vocabulary has taken the contrabass from its traditional role to assume the position of a major solo instrument. His body of work includes music of all genres: solo to symphonic "with everything else in between". Equally versed in contemporary, jazz, improvised and classical music, he also is a prolific Klezmer artist ("Playing Klezmer is like coming home"). Has received numerous awards for compostion. "Despite his achievements he maintains his passion for musical exploration and transmitting this energy, in music and elsewhere, to all. 'There was no master plan, 'he says. 'Life's been an improvisation' " (Christopher Williams). With great pleasure we welcome Cecil Taylor and Tony Oxley back to Berlin, whose brilliant performance at the TMM '02, paying homage to Peter Kowald, is well remembered by all who had the privilege to attend. They play tightly together, each one following the other's musical direction - almost like two migrant birds which instinctively create, synchronously, their own wave patterns. However, Cecil Taylor and Tony Oxley come from quite different cultural and musical traditions. The fact that they are able to find such a sure way of getting together has certainly something to do with the degree to which both have been able to assimilate the experience of Black music and European modern music. No fashionable crossing of frontiers, in order to find the lowest common denominator, but an opening up from both sides, based on a musical identity which can lay claim to the demonstration of an up-to-date awareness of sound. Hardly a duo, in which the feeling of flow and pulsation, together with all of the inner structural refinement of timbre would have been brought to life in such a manner. Just as Taylor, over a period of many decades, has worked at the development of his own language, Oxley came, via a varied and highly individual route, to a personal 'percussive' style of drumming in which the traditional handed down rudimental beats have been replaced by a more flowing and moving type of playing. Breaking up the uniformity of rhythmical patterns allows, at the same time, an increase in the feeling of continuity and intensity. In this endeavour, the encounter is between Taylor, who comes mainly from the traditions of the Black, Red Indian and Asian cultures, and Oxley, who has gone, from working with Jazz to improvisation and subsequently found a 'sounds' type of language more European in character. But since Music has moved onto the World's so called 'stage' (which definitely has nothing to do with the fusion of 'world' music), it is no longer possible to separate the thinking about, or practicing of, one kind or the other. A good grounding in one's own tradition seems to be a prerequisite, as well as keeping an openness for what is on the same level and has been developed, with the same determination, somewhere else. And so, this is the get-together between Cecil Taylor and Tony Oxley - intuitive, and with an equal sense of resolution. Leaving aside the superficial contrast, this duo reveals, through the differentiation in the rhythm and the structure of the sounds, a high degree of experience, that has been accumulated over many decades (Bert Noglik). Farhan Sabbagh, Komponist und Solist, gilt als einer der besten zeitgenössischen Virtuosen der arabischen Laute und ist ein Meister arabischer Perkussion. Unterricht auf der arabischen Kurzhalslaute (Ud) und Gesang bei seinem Vater und seinem Großonkel, einem bedeutenden Sufimeister. Ab 1962 Studium der traditionellen arabischen Musik, ab 1966 Studium der modernen arabischen Musik in Syrien. 1970-72 Kompositionsstudium am Institut für Orientalische Musik in Kairo; 'Al-Farabi'-Preis für beste Komposition. 1973 Konzerte und erste Plattenaufnahmen in Griechenland und anderen Teilen Europas. Lebt und arbeitet seit 1981 in Berlin (Internationales Institut für Traditionelle Musik). Zahlreiche Solo-Konzerte in Europa und der arabischen Welt sowie Workshops, Rundfunk- und Fernsehauftritte. Konzerte und Tourneen mit internationalen Musikern und Ensembles (L. Subramaniam, G. Feidman u. a.). Beteiligung an Projekten im Bereich Literatur, Theater, Bildende Kunst und Wissenschaft (Auftritte mit Annemarie Schimmel, Adonis, Rafik Shami, Marianne Hoppe u. a.). Umfangreiche Diskographie. Pat Thomas studied classical music and played reggae. First improvised gigs in 1979. 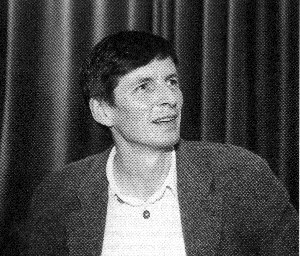 In 1988 he was awarded an Arts Council Bursary to write three new electroacoustic compositions for his ten-piece ensemble Monads. He has been a member of the Tony Oxley Quartet (with Phil Wachsmann, Matt Wand) and performed with this ensemble at the TMM '99 (a/l/l 001), played in Oxley's Angular Apron (with Larry Stabbins, Manfred Schoof and Sirone) and in Oxley's Celebration Orchestra. Works in duo with Mark Sanders, in trio with Beresford and Francine Luce, and many other formations. Published an article on 'Islam's contribution to jazz and improvised music' (Rubberneck, No. 15, 1993). Ronit Kirchman, composer, multiinstrumental performer, electronic artist and songwriter based in Los Angeles. As an improviser she most often plays violin. Her other performance instruments include the 7-string electric violin, voice, guitar and electronics. Has received a classical training as violonist and played in a variety of contexts in experimental, classical, jazz, rock, blues and country groups. She has performed and recorded with Wadada Leo Smith, Vinny Golia, Torsten Müller, Jack Wright, Elliott Sharp, and many others. Her performance at TMM '03 is a European debut. John Edwards, after taking up the bass around 1987, he co-formed The Pointy Birds appearing in festivals at Glasgow, Edinburgh, Moers, Leverkusen, Copenhagen. In 1990 John played his first gigs with London improvisers such as Roger Turner, Lol Coxhill, Maggie Nicols, Phil Minton. Between 1990 and 1995 Edwards was a member of B-Shops For The Poor, The Honkies and GOD and became a regular player on the London improvised music scene, collaborating with Evan Parker, Tony Bevan, Veryan Weston, and Elton Dean. Performed at the TMM '99 in trio with P. Dunmall and J.Butcher (FMP CD 116). Schreiße! Dies ist keine Theateraufführung, sondern die musikalische Bearbeitung von Alfred Jarrys schwarzer Komödie 'Ubu Roi' (1896) durch das King Übü Örchestrü und Gästen aus Anlass seines 20-jährigen Bestehens. Ubu und seine Paladine sind interessanterweise unzerstörbar. Es ist nicht zu befürchten, dass die Komödie von 1896 ihre Aktualität verliert.